Non-carbonized British photographer Kane Quinnell is lucky to be alive after snapping this rather spectacular photo of lightning near his home. 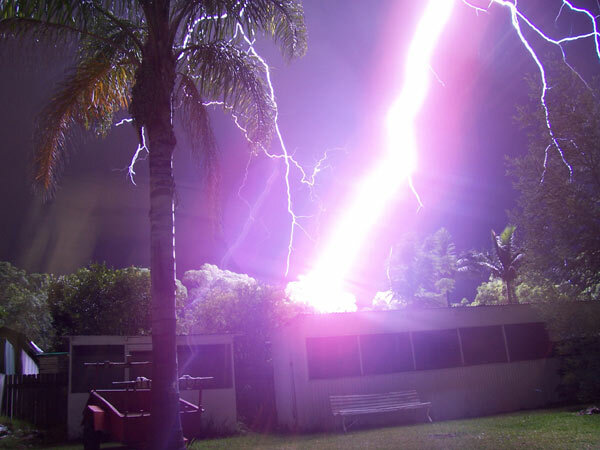 He tells the Daily Mail about being launched several feet into the air as lightning connected with the house next door. [Via] For his trouble he’ll be featured in an Australian weather calendar. Elsewhere in the Daily Mail you can find an extremely cool shot of the International Space Station and shuttle Atlantis silhouetted against the sun. Be sure to click the image to see the shapes in more detail. wowwaaahhh! Any way i can get this shot in high res?